NOTE: Date must be in the form YYYY-MM-DD, like 2019-04-11. He loved working on lawn mowers, collecting hot wheels, drawing and fishing. He was a self-employed mechanic worker and attended Corinth First Church of God. Chris Wesley, of Liberty, KY passed away on April 9, 2019, at Casey County Hospital. He was 42. The funeral service will be held at 1pmCT/2pmET on Friday, April 12, 2019 at Corinth First Church of God with Bro. Tim Carman and Bro. Steven Willingham officiating. Burial will follow in Middleburg Cemetery. The family will receive friends from 5-8pmET on Thursday, April 11, 2019 and from 9-2pmET Friday, April 12, 2019 at Corinth First Church of God. 2019-04-11 - Columbia, KY - Photo by Billy Joe Fudge. 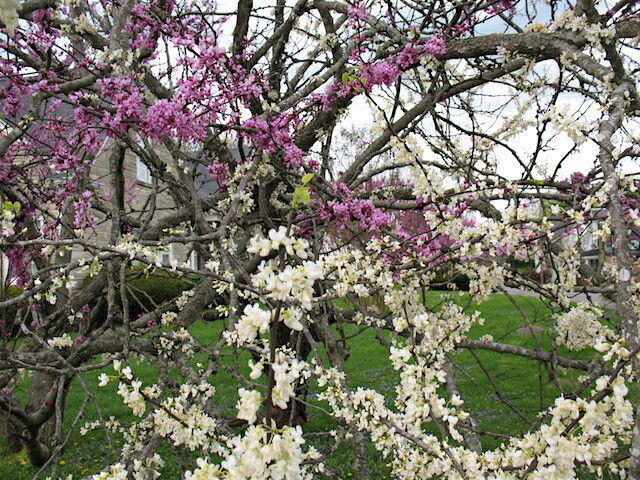 The Great Wooded South is Redbud Heaven this Spring. Beyond a shadow of a doubt, this is the most prolifically spectacular Redbud bloom of my lifetime. I did want to share this White Redbud bloom with you on the corner of Jones and Greensburg Streets. It and a traditional Eastern Redbud stand side by side but the White one is in really bad health and I wanted to record its beauty for posterity. Went home for lunch and received a free, refresher Introduction to Physics course, courtesy of one of our local rock quarries, a chance placement of two empty glasses sitting in the bottom of our kitchen sink and silence. While standing at the sink, silently contemplating my options for a quick lunch, the two empty glasses which were either barely touching or barely not touching, double dinged! In the immediate, two second aftermath my mind waxed back to the July 27th 1980 Earthquake which rattled Kentucky. I glimpsed Libby, her brother Todd and me waking Shay, Cameron and Prindle to get them out of our shaking house. Then and almost immediately, the sound waves from a blast at one of our local quarries arrived. Sweet relief poured over me at the realization that this was not an earthquake. Thankfully, it was only shock waves from the blast which had dinged the glasses. Then, I remembered from my Introduction to Physics and Chemistry class in high school taught by Ms Ethyl Scott and her very able student teacher Linda Grider, that shock waves travel faster than sound waves. Thankful for good teachers and the "refresher" courses we get along the roadways of life. Phyllis Ann Reynolds of Campbellsville, daughter of the late Dillard Richerson and Gladys Celia Hutcherson Richerson, was born May 13, 1936, in Taylor County, Kentucky. She died Monday, April 8, 2019 in Cox's Creek at age 82. Funeral services will be at 10amCT/11amET Saturday, April 13, 2019 at Parrott & Ramsey Funeral Home in Campbellsville by Rev. Jim Collison, Jr. and Rev. Brent Gupton. Visitation is from 5-8pm Friday, April 12, 2019. Burial will be in Campbellsville Memorial Gardens. Pallbearers will be Jonathan Hahn, Ricky Hahn, Jim Mings, Nathan Pendleton, Romey Addison Reynolds, III, Romey Reynolds, Jr., Craig Richerson, Kevin Richerson and Scott Richerson. Philip Yoho has been named Director of Graduate Business Studies at Lindsey Wilson College. Yoho comes to LWC from Pasco-Hernando (FL) State College where he specialized in design and curriculum development of new academic programs in business, supervision and management. "I have been in higher education for more than 18 years. The three previous institutions I worked for hired me to start new business programs from scratch." Yoho will be taking on the responsibilities previously shared by faculty in the LWC School of Business. Frankfort, KY - Gov. Bevin joined U.S. Army Cadet Command and Fort Knox Commander Maj. Gen. John Evans Jr. at Scott Middle School in Fort Knox to proclaim April as the Month of the Military Child in Kentucky. "We are deeply grateful for our many military children, who exemplify strength, resiliency and sacrifice just like their parents who selflessly serve our nation," said Gov. Bevin. "Kentucky's reputation as the most veteran-friendly state in America continues to grow, and we applaud organizations like the Military Interstate Children's Compact Commission (MIC3) that work to help ease transitions for military families. I hit the floor at 6:00 A.M to start waking the grandkids for school. For four days, I stayed with Luke (15), Eme (13) and Noah (11) at their home in Texas while their parents were on business trips. For the first time in years, I had them all to myself! Since the first one didn't leave until 7:20, I got up early to have coffee, but I couldn't get the Keurig for work; so after twenty minutes of pushing, pressing, unplugging, and almost boiling water and dumping grounds that came inside the pods to make coffee the old fashioned way, I gave up. Fully expecting to have to go through the routine of telling each child to get up, brush their teeth, comb their hair, don't forget their homework and all the other daily rituals I once went through with my own, I was stunned when I heard the patter of two different sets of feet upstairs just like clockwork every morning at 6:45. Spencer Claypool and Brandon Burton, both of the ACHS Class of 2015, have been nominated for the prestigious Oak and Ivy Award at Kentucky Wesleyan College. According to Kentucky Wesleyan, "Oak and Ivy is Kentucky Wesleyan's highest honor. As voted on by faculty and staff, the Order of Oak and Ivy is presented annually to six students who best exhibit spiritual leadership, intellectual ability, strength of character, dedication of purpose and devotion to Christian ideals in seeking to promote the interests and welfare of Kentucky Wesleyan College." Only thirty-five students are nominated by faculty and administrative staff to receive this most prestigious award. A panel of Oak and Ivy alumni will help with the selection of inductees and the six students who have been selected for Oak and Ivy membership will be named at an awards dinner on Friday evening, April 12, 2019. Unused medicines can cause problems such as accidental poisonings and overdoses. The EPA warns that flushing medicines down the toilet or sink can lead to problems in the local water supply. The DEA's National Prescription Drug Take-Back Day offers a way for consumers to dispose of unused prescription medicines safely and easily. The next Prescription Drug Take-Back Day is scheduled for Saturday, April 27, 2019, from 10amCT until 2pmCT. For more information, or to search for other locations, visit: takebackday.dea.gov. So, what really is a hamburger? Some years ago when one of my sons was around four years old, he was in the back seat as we ordered from a fast food drive-thru. He wanted a plain hamburger. When we got his sack and handed to him in the back, we heard an angry howl. "Whatever is wrong?" we asked. "I wanted a plain hamburger and this one has a bun on it!" A group of Lindsey Wilson College doctoral students were recently awarded first place at the American Counseling Association Conference and Expo for their submission in a national ethics essay competition. Connie Elkins from Richlands, VA, Sherry Miller from Louisville, KY, and Jay Tift from Brentwood, TN, were the three members of the winning team from LWC. They received their award in front of more than 4,000 guests at the ACA National Conference and Expo held in New Orleans on March 29. The team members are students in the LWC Doctorate of Philosophy in Counselor Education & Supervision Program which launched in 2014. A team of students from LWC's Counseling & Human Development master's program also placed in the competition. Columbia natives Crystal Gayle Burriss, Lynnsey Rodgers-Oakes and Brianna Taylor received third place in the national competition. This is the second time LWC has placed in the master's category. The college placed first in 2015. Second Christian Church, 829 Burkesville Street in Columbia is having a fund raising fish fry, Friday, April 12, 2019 starting at 11amCT. All are welcome! For delivery call 270-805-1646 or 270-250-1858 to place your orders. Donations are welcome. Mowing Season is Upon Us - Spring weather and recent rains have sped up the need to mow or bush hog in some instances. Typically two seasonal employees are hired at the Road Department to help with this task. There were six applicants this year and the decision was made by the magistrates and Road Foreman Barry Hamlett to hire three at $9.60 per hour. The following were hired effective immediately: James Earl Bennett, Steve Foster, and Gary Coffey. Each was unanimously approved by the court. Frankfort, KY - State Budget Director John Chilton reported today that General Fund receipts climbed 10.7 percent in March with revenues of $820.1 million. March's receipts compare favorably to the $740.6 million collected in March 2018. Through the first nine months of FY19, the General Fund has grown 3.9 percent. The official General Fund revenue estimate for FY19 calls for revenue to grow 3.3 percent compared to FY18 actual receipts. After March's results are considered, General Fund revenues must increase 1.7 percent for the remainder of the fiscal year to meet the official estimate. Campbellsville, KY - Dr. Michael D. Rice, pastor of First Baptist Church in Glasgow, KY, will be Campbellsville University's Holy Week chapel speaker at 10amET on Wednesday, April 17, 2019, in Ransdell Chapel at 401 N. Hoskins Ave., Campbellsville, KY.
All chapels are open to the public free of charge and are streamed live on the internet at wlcutv.com. The annual meeting of the Robert Penn Warren Circle will begin April 25 at Western Kentucky University with a screening of the documentary film Robert Penn Warren: A Vision. This original KET production explores the life and career of Kentucky's most acclaimed writer, the first Poet Laureate of the United States, and winner of Pulitzer Prizes in both fiction and poetry. It traces Warren's birth and upbringing in Guthrie, his years at Vanderbilt University, and his career as a poet, novelist, scholar, and journalist. The film screening will take place at 8pmCT in Cherry Hall 125, 1906 College Heights Blvd, Bowling Green, KY. It is free and open to the public. It's currently 62F at the Adair County Mesonet station. It should be mostly sunny today, with a high near 82F. Breezy, with a south wind 8 to 13 mph increasing to 17 to 22 mph in the morning. Winds could gust as high as 31 mph. There's a chance of showers and thunderstorms overnight. Otherwise mostly cloudy, with an overnight low around 61F. South wind 15 to 18 mph, with gusts as high as 31 mph. The chance of precipitation is 60%. Showers are likely on Friday, with the possibility of a thunderstorm. Cloudy, then gradually becoming mostly sunny, with a high near 72F. Southwest wind 10 to 15 mph. The chance of precipitation on Friday is 70%, and new rainfall amounts between a tenth and quarter of an inch are possible. There is a small chance of showers Friday night. Otherwise expect partly cloudy skies with a low around 50F. Southwest wind around 6 mph becoming calm in the evening. Adair County: No events Circuit Court. No events District Court. Casey County: 2 events Circuit Court. No events District Court. Cumberland County: 2 events Circuit Court. 8 events District Court. Green County: 2 events Circuit Court. No events District Court. Metcalfe County: No events Circuit Court. 3 events District Court. Russell County: 17 events Circuit Court. 12 events District Court. Taylor County: 2 events Circuit Court. No events District Court. --Robert Stone, Thursday, 11 April 2019.